A new entrant to the FTSE 100, Smurfit Kappa Group (SKG) has achieved big things in recent years. The Dublin-based company has seen a steady rise and, with operations now spanning three continents and 34 countries, controlling the finance function of this giant of the industry is no easy task. Stephen Hall sits down with Ken Bowles, who has been part of SKG’s journey for almost 25 years, to discuss his first year as group CFO, managing complexity and leading the search for the finance directors of the future. The story of Smurfit Kappa began when founder Jefferson Smurfit Sr started making boxes in the Dublin suburb of Rathmines in 1934. In 1950, Smurfit decided to concentrate on corrugated box production and built two paper machines. Since those humble beginnings, Smurfit Kappa Group (SKG) has developed hundreds of plants around the world and become one of the most successful packing companies in Europe. It now produces over seven million tons of paper and board a year – enough to fill the streets of Rathmines many times over. What you have to do as CFO is step away from the numbers and allow others to give you what you need. Ken Bowles’ 23 years of service with SKG has included roles in various parts of the company, and he has been central to the strong performance of the broader corporate and finance team for many years. In 2004, the Dublin native was appointed the group’s first head of compliance. This was followed by a role as head of tax before Bowles became group financial controller in 2007. He was appointed chief financial officer in April 2016, and this rapid transition is a reflection of the company’s growth as a whole. His role in the story of Smurfit Kappa has evolved from an array of supporting characters to one of its lead protagonists. Even though it’s a well-trodden path from controller to CFO, Bowles admits his universe has altered exponentially in the past year. Bowles’ period of service is not atypical of a SKG employee. Irene Page, his successor in the role of group financial controller, has also spent over 20 years with the business. The CFO admits that this seamless succession has helped him make the step up, and he’s happy to allocate his old duties to Page and the finance team while navigating the more strategic side of his responsibilities. And those ambitions are grand. Having transferred its primary stock market listing from Dublin to London earlier in the year, Smurfit entered the FTSE 100 in December 2016, becoming the fifth present Irish member of this most prestigious of clubs. It was the result of a long-term turnaround programme that saw the group increase its market capitalisation fivefold in just five years – but, despite all the success, such heightened visibility surely brings its own pressures for the man heading up the finance function. It helps if a company can remain anchored to a set of core principles and, sure enough, there are still elements of this multinational corporate that would be recognisable to its 1930s Rathmines origins. This is demonstrated at the very top, with Tony Smurfit, grandson of founder Jefferson, appointed CEO in September 2015. One gets the impression from Bowles that he is fully invested in this sense of being part of a family business. At Smurfit Kappa, the one thing we never lack is help and support. And, in a role like this, you need it. “It’s funny – it’s been a 20-year journey, and what always surprises you is the level of support and help you get from your colleagues, even though you’ve been around for a long time,” he says. “At Smurfit Kappa, the one thing we never lack is help and support. And, in a role like this, you need it. The CFO has certainly taken those opportunities when they’ve come around but controlling the finance function at a company with over 40,000 employees can be a heavy responsibility. Bowles joined the group in the year that train travel between France and the UK became possible, Nelson Mandela won the South African presidency, and Prince Charles admitted extramarital infidelities. It’s fair to say that much has changed since. And Bowles recognises that more than two decades at SKG have played a big part in his approach to leadership. You need to understand consumer behaviour and how packaging is going to react in that space. You need to look at the global macro trends that could disrupt your strategy. As the world has changed, so too has the global consumer packaging industry, which is now valued at €360 billion. Like any modern CFO, it’s no surprise that Bowles is more than just a finance expert and also views himself as a strategist, taking great interest in the industry as a whole. To stay ahead, SKG employs 700 designers across the business to influence customer choice. From egg boxes and strawberry containers to cat houses and award-winning cardboard tents that can absorb 400% of their weight in water, the repertoire of innovative design is impressive. As the financial strategist at the head of this creative portfolio, Bowles has no choice but to be rooted in the here and now, but he is also keen not to take his eyes off the next generation coming through. 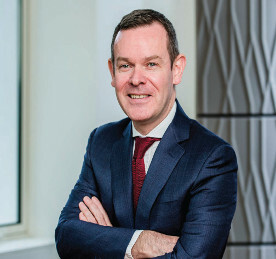 Bowles reasons that the Smurfit approach of constant engagement, help and support has been the catalyst of his long stay at the company, and will be the motivator for the financial and senior executive stars of the future. As Bowles looks to the sustainable future of the management team of SKG, the company is just as committed to its impact on the future of the planet. While it has been a big year for Bowles, it has also been a good year for the company’s sustainability goals. During 2016, SKG achieved a 22.9% reduction in CO2 emissions from 2005. Among its other environmental goals, the company has planted 103,000ha of forestry to date and is on target to reach a 25% reduction in CO2 emissions by 2020. The finance function is also very much involved in driving the group towards a more sustainable future and, with so many plates to keep spinning, one wonders how Bowles finds time to relax. He acknowledges that the CFO role can be an all-consuming one, but he still makes time to unwind. If there’s one piece of advice he could offer himself, looking back on his 12 months in charge, it would be to learn to revel in the challenge. “Enjoy it and breathe,” he reflects. “It’s a big step up, even though I’ve been in the group for over 20 years, and I was the controller and very much part of the management team. You put a lot of pressure on yourself. Ken Bowles, CFO at Smurfit Kappa Group: enjoy the day and worry about tomorrow when it comes.